By Prabhakar Chitrapu, in collaboration with his sisters Vijayalakshmi Tummalapalli & Annapurna Sattiraju. It is quite common for great artists to be influenced by earlier artists or other role models. Additionally, it is also not uncommon that there comes a break point in time when the artist's style changes into their own creative and distinctive style. For example, this is evident in Beethoven’s compositions, when his earlier works was reminiscent of Mozart’s works, but then starting with the 5th symphony, Beethoven imprinted his own distinct stamp and signature. We see such transitions in van Gogh's paintings etc. Coming to tyAgarAja, do we see any influences on his compositions by his predecessors, and we do notice a break point, where his distinctive style - either in music or lyrics - begins to blossom? From what I am aware of, I do not believe that these topics have been deeply investigated and documented. What IS known, based on a myriad of biographies and his own compositions, is that he deeply respected and regarded his predecessors, some mythical and some historical. For example, in several of his compositions, tyAgarAja reverentially refers to personalities such as nArada, vAlmIki, purandara dAsu, rAmadAsu etc. But we do not exactly know in detail whether this was simply an expression of his reverence or whether their works actually influenced tyAgarAja's works in visible ways. Alas, even the question of a possible break point in his compositional style is made even more complex by the the fact that the chronology of his compositions is not known. The only exceptions are a few compositions, where the dates can be deduced from the anecdotes associated with them. In some of tyAgarAja's biographies, there are repeated references to the fact that tyAgarAja was influenced by a 15-16th century Telugu poet, called bammera pOtana or briefly just pOtana. However, any detailed exposition of such an influence was not easy to come by. In this article, I attempt to dig a bit deeper into this topic and share my thoughts on the possible influence pOtana on tyagaraja. I hope that the readers be tolerant as I devote a few lines to introduce pOtana and also state some interesting facts about his main literary work, SrImadAndhra bhAgavatam. While I do this for the benefit of the non-telugu speaking readers, I think that some of these details would interest even those telugu-speaking readers, who may already be familiar with pOtana and his bhAgavatam to some extent. pOtana and pOtana bhAgavatam are generally household names among Telugu speaking people in India and abroad. According to Wikipedia, pOtana's time period was 1450–1510 AD, although a recent reference  argues that pOtana was born around 1372 AD and that he wrote bhAgavatam around 1400 AD. He hailed from a village called bammera, near the town of Warangal (which was referred to as Orugallu, Eka SilA nagaram etc) in the present state of Telangana in southern India. pOtana is credited to have written 4 books, the magnum opus SrImadAndhra bhAgavatam, bhOginI danDakam, vIrabhadra vijayam and nArAyaNa Satakam. Of these, the first work, commonly referred to as "pOtana bhAgavatam" is the most popular and beloved work by the vast majority of the Telugu speaking people. Poems and episodes from this work are regularly recited in several households, taught in schools and lectured about in temples & other venues. pOtana bhAgavatam has a total of 9005 poems as well as prose sections (called vacanam's). It is organized into 12 Sections, called skandam's. A fact that is not as widely known is that pOtana bhAgavatam was not written completely by pOtana alone!! pOtana wrote only 8 Sections, namely Sections 1-4 and Section 7-10. The remaining 4 Sections were written by gangana (Section 5), singana (Section 6) and veligandala nAraya (Sections 11&12)! Furthermore, these details are revealed by the text in the bhAgavatam itself, which also exposes a rather special structure of these Sections. Each Section ends with a detailed paragraph in prose (gadyam), in which there are details of who wrote the Section and what the contents of that Section were! For example, the prose paragraph at the end of Section 1 says "idi SrI paramESvara karuNA-kalita kavitA-vicitra kEsana-mantri-putra sahaja-pAnDitya pOtanAmAtya praNItambaina SrI mahAbhAgavatambanu mahA-purANambu-nandu naimiSAraNya-varNanambunu, SaunakAdula praSnambunu, ……Sringi-SApabhItunDai uttarAnandanunDu gangA-tIrambuna prAyOpavESambunanunDi Suka-sandarSanambu sEsi mOkshOpAyamu aDuguTayu, anu kathalu-gala prathama-skanthamu" - meaning that it is the first section of SrI mahAbhAgavatam containing stories such as description of naimiSAraNya etc. and written by pOtana, son of kEsana-mantri & a natural scholar! Similarly, the ends of Sections 5,6, 11-12 state that they were written by gangana singana and nAraya respectively! Another interesting fact is revealed in the way the last author nAraya was introduced. He is referred to as "pOtanAmAtya-priya-Sishya-velingandala-nAraya" - meaning veligandala nAraya, who was a dear student of pOtana! As to why pOtana bhAgavatam had to be written by 4 authors, there are two possible accounts . The first is simply logistical - time periods, death of pOtana etc. The second account was fascinating. It is well known that pOtana refused to dedicate his bhAgavatam to the local king and instead dedicated it to the Universal God SrIrAma (more on this important aspect later in this article). Apparently, the local king was angered by this and had the bhAgavatam buried! The story goes on to presume that when the work was recovered, some sections were damaged and had to be re-written! Finally, there are a few details regarding the publishing of pOtana bhAgavatam in print. According to , pOtana bhAgavatam was first printed in 1848 by brahmaSrI purANam hayagrIva Sastri by vAviLLa publishers. Sastri gAru collected and consulted twenty copies of pOtana bhAgavatam available to him and produced the first print version. It would follow that any copy of pOtana bhAgavatam before 1848 would have to be a handwritten version, either on paper or on palm leaves. This will be relevant for us later in this article. Those interested in knowing more about pOtana and his bhAgavatam may refer to [2,3]. The following details are presented in [4, pp. 118-119]. tyAgarAja was presented a hand-written paper copy of pOtana bhAgavatam by his prominent student vAlAjapET venkTaramaNa bhAgavatAr, on the occasion of tyAgarAja's 60 the birth anniversary (shashTAbdipUrti). The copy was "possibly hand-written by the student himself and is now in the saurAshTra sabha in Madurai", Tamil Nadu, India. Furthermore, "the paper on which the bhAgavatam is written bears the watermark impression: 1823, 1824 and 1825. In the water mark impression, we see the spade of Trade mark and also name of the firm: Wise and Co."
Figure below shows a picture of a page from this manuscript. 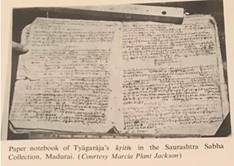 Apparently, this copy of the bhAgavatam was used by tyAgarAja for his daily pArAyanam [4, pp. 118-119]. I would guess (no references are available on this) that tyAgarAja could have been reading/reciting pOtana bhagavatam poems even before this event (since that would have been a good reason for vAlAjapet venkaTaramaNa bhAgavatAr choosing to present it in the first place. In any case, it is written in most biographical accounts that tyAgarAja was fond of pOtana bhAgavatam. For example, P. Sambamoorthy in [4, pp.144-145] says that Thyagaraja was "passionately fond of pOtana's bhAgavatam" . It is also referenced in tyAgarAja's biographical accounts that his mother would sing songs of PD, Ramadas, Narayana Tirtha , but I was unable to find any references about his mother reciting pOtana bhAgavatam poems. This is surprising because several poems and several chapters of pOtana bhAgavatam are very popular in Telugu speaking families. For example, gajEndra mOksham, rukmiNi kalyANam, prahlada caritram are known by-heart by many housewives, students and scholars. Now I will address in the categories of "Life Values, Ideas expressed in the Compositions and the Linguistic Style", the central question of this article - what, if any, are the influences of pOtana and pOtana-bhAgavatam on tyAgarAja and his works. Both pOtana and tyAgarAja were bhaktas of SrIrAma, amply evident from the numerous compositions of tyAgarAja addressing SRIrAma. pOtana was, in a dream, urged by SrIrAma to write bhAgavatam in telugu. In the following poem in the bhAgavatam, pOtana says that it is rAmabhadruDu who actually is making him say/write the bhAgavatam. It is interesting that pOtana was initially a Saivaite, and later became more liberal in accepting all forms of Gods as representing a single universal Truth. At this point, SrIrAma became his ishTa daivata and remained so. Similarly, it is written that tyAgarAja was originally devoted exclusively to SrIrAma and later in his life broadened his view to embrace all forms of the Universal Principle. Both pOtana and tyAgarAja led simple lives. tyAgarAja practiced unca-vrutti (practice of not accumulating, but asking for alms needed for the day). While it is argued by some that this may not have been literally true (considering that he had many students living with and learning from him), it is true that he disdained the value and accumulation of wealth. Perhaps the most well known example of this is the rejection of the gifts sent by the local king (more on this later in the article). Additionally, there are two anecdotes, where some money was being secretly given to him by his prosperous admirers, and which he promptly discarded when he came to know of them. One is in the context of mundu-venuka kriti in darbAr rAga, and another was an anecdote attributed to Sundaram Mudaliar in Chennai. pOtana was initially probably not such a simple man, since he did embrace the graces of local kings (in fact, dedicated his bhOginI danDakam to the local king), but later rejected the corruption of the rich and powerful, and led his life as a simple farmer. Now, we will investigate on some common ideas or concepts expressed by tyAgarAja in the lyrics of his compositions and poems of pOtana. · Spurning of wealth: An example of a common idea that is generally quoted in many tyAgarAja's biographies is that of spurning the gifts and wealth offered by rich and powerful people. It is a well-known anecdote in tyAgarAja's life that the local king, sarabhOji, offered several expensive gifts to tyAgarAja, and that tyAgarAja refused them steadfastly despite tyAgarAja's brother, japESa, pressuring him into accepting the gifts,. In this context, tyAgarAja was supposed to have composed the kriti "nidhi cAlA sukhamA?" in rAga kalyANi. In this, tyAgarAja debates whether wealth or the closeness of SrIrAma is superior. Similarly, pOtana was apparently approached by the local king, sarvajna singa bhUpAla, for pOtana to dedicate the bhAgavatam to him. In the following famous poem, pOtana describes what happened then. ర్ణాట కిరాటకీచకుల కమ్మ త్రిశుద్ధిగనమ్ము భారతి. rNATa kirATakIcakula kammatri Suddhiganammu bhArati. Effectively, he says that the Goddess of Letters, sarasvati, appeared to him in a dream with tears flowing down to her breasts (kATuka kanTi nIru canukaTTu vayimbaDa), for the fear that pOtana might actually offer the bhAgavatam to the king. Seeing this vision, pOtana assures Her (O madamba! O hATaka garbhu rANi!) that he would never sell Her to evil cruel humans (karNATa kirATa kIcakula) and pleads Her (bhAratI!) to trust him. Further, in the following poem, pOtana declares that he would dedicate his works to SrIhari, instead of offering them to corrupt human beings. Here pOtana is saying (free translation): Instead of offering to such lowly human kings and receiving lands, carriages and wealth in return and subsequently suffering from them, this one bammera pOtarAju has decided to dedicate to SrIhari and is writing bhAgavatam for the benefit of the world. The word that pOtana used to describe the rich, powerful and corrupt people is manjujEsvara+adhamulu (human kings + lowly people). tyAgarAja uses exactly this expression in the durmArgacara+adhamula (followers of bad paths + lowly people) in rAga ranjani. In fact, the meaning of this kriti comes even closer to the above cited poem of pOtana. · I will not serve those that are the lowly among those that tread the path of vices. · When the Lord himself is the wealth and nourishment, I will not serve the lowly…. · The wretched ones who offer their literary skills in the courts of kings to down-trodden humans, I will never acknowledge! Oh SrIrAma! In another kriti, gaTTi gAnu ceyi paTTEdennaTikO in rAga bEgaDa, tyAgarAja elaborately laments about the futility of serving the rich and powerful, who are ignorant and degenerate. The above examples hopefully convince the reader that both pOtana and tyAgarAja looked down upon material possessions and associated vanities, and conveyed these beliefs in their poems and kritis respectively. · P. Sambamoorthy, author of the authoritative and definitive biography of tyAgarAja  says "Some disciples were assigned the task of keeping a constant vigil night and day to wait for the moments when new songs would emerge from the mouth of the composer, extempore. These new compositions usually emerged after his Parayanam of Valmiki Ramayana and Potana Bhagavatham, every day. Sometimes these extempore songs came out at odd moments, like the dead of night." Based on this, we can certainly infer that several of his compositions were triggered by what he read in pOtana bhAgavatam! In the following, I will try to find some concrete examples. Although tyAgarAja was primarily a rAma bhakta, he did compose kritis on several other deities, such as Siva, pArvati, ganESa, narasimha, krishNa etc. Consider the compositions of tyAgarAja on krishNa such as sAdhincenE, vENugAnalOluni, etc. In addition, there is a full musical play naukA caritram, which is entirely based on a story about krishNa. While the episode of naukA caritram is not found in pOtana bhAgavatam, the other musical play of tyAgarAja, namely prahlAda bhakti vijayam, has a prominent place in pOtana bhAgavatam. The other popular parts of pOtana bhAgavatam are gajEndra mOksham and rukmiNI kalyANam. The ideas of gajEndra mOksham occur in more than one composition of tyAgarAja: vAraNarAjuni …in the very popular kriti kshIrasAgara Sayana in dEvagAndhAri rAga, nAmoralanu vini kriti in Arabhi rAga etc. So, one could argue that, next to SrIrAma, krishNa gets the second most significant place in tyAgarAja's compositions. Could this be because of the influence of reading pOtana bhAgavatam regularly (daily)? I would like to posit so. · I would like to bring your attention the rhetorical questioning style: Why those eyes (kannulElE) that cannot see (kanukonani) the beauty (sogasu) of vishNu (pannaga Sayi)? Why those hands (karamulElE) that do not worship (pUjincani)? Why that tongue (nAlikElE) that does not praise (pogaDani) SrIrAma (rAmamUrti)? There are at least a couple of poems of pOtana that have similar ideas. తండ్రి హరి జేరు మనెయెడి తండ్రి తండ్రి. tanDri hari jEru maneyeDi tanDri tanDri. It may interest the reader to know that this poem (as well as the next one) are from prahlAda caritram part of the bhAgavatam, when prahlAda is talking to his father about the value of dedicating ones life to the pursuit of vishNu. Indeed the last line clearly suggests it. It is true that the meaning of the above poem is in the "positive" (that is, he says what a real hand/eye/. Should be) unlike the meaning in tyAgarAja's above kriti which is in the "negative" (that is, he says that hand/eye…that does not worship/see/… is not a real hand/eye/…). However, I do think that the overall thought structure is similar. Actually, the next poem in the same prahlAda caratram of pOtana is in the "negative", making it more aligned with tyAgarAja's thought construction. విష్ణుభక్తి లేని విబుధుండు విబుధుడే? పాదయుగముతోడి పశువు గాక. vishNubhakti lEni vibudhunDu vibudhuDE? pAdayugamutODi paSuvu gAka. tyAgarAja composed a musical play called naukA caritram, which is a playful account of gOpikas taking krishNa out on a boat ride. Subsequently, they get caught in a storm, pray to krishNa and are saved.The musical play consists of 35 songs and is a delightful description of joy, mischief and playfulness. It is one of the rare works of tyAgarAja where devotion etc do not play a major part and the work can be enjoyed as a secular musical work. While there is no corresponding account in pOtana bhAgavatam, there are elaborate and equally delightful accounts of rAsakRiDalu, which describes the playful incidents of krishNa and gOpikas (daSama skandam - pUrva bhAgam, episodes 38-39-40). Is it possible that some of the ways in which tyAgarAja narrated his playful accounts were suggested by similar ones from pOtana. However, this question merits deeper research. Finally, let us consider the linguistic styles of pOtana and tyAgarAja. It is widely recognized that both tyAgarAja and pOtana’s styles are generally simple. It should be noted that even though this is a general characterization of their works, both have composed highly complex works. For example, the ghana rAga pancaratna kritis of tyAgarAja would fall in this category. There are numerous examples to illustrate the simplicity of the linguistic styles of tyAgarAja and pOtana, and here are just a few. కలడు కలండనెడి వాడు కలడో, లేడో? kalaDu kalanDaneDi vADu kalaDO, lEDO? This is a poem of pOtana in the gajEndra mOksham episode, where the elephant is tired and almost giving up praying to vishNu, wondering whether He is really exists or not! This is a poem from the introductory sections, where pOtana is praying to his favorite deities and asking for good qualities, such as serving the Lord, friendship with His devotees and piety to all living beings. Of course, it is hard to further quantify this idea of simplicity, except to say that the words chosen are not heavy and complex words. Their sounds are also not complex and tongue twisting, but rather easy to say and hear. For example, there are few compound sounds (involving more than one consonant per phonetic unit). Counting, the four pOtana poems have 1 of 51 and 2 of 46 compound phonetic sounds respectively. Similarly the four tyAgarAja compositions have 11 of 130 and 5 of 99….compound phonetic sounds respectively. నుడుగిడు నడుగిడదు జడిమ నడుగిడు నెడలన్! nDugiDu naDugiDadu jaDima naDugiDu neDalan! Here we see the sound Da repeats itself several times. Incidentally, it is a poem from ganEndra mOksham episode, wherein pOtana is describing how hurriedly vishNu is leaving vaikunTha to save the elephant. The fast repeating Da sound suggests the hurry and anxiety too. For tyAgarAja, I would like to suggest yOcana kamala lOcana in rAga darbar. Here the sound 'cana' repeats often. I conclude this essay with linguistic phrases that I found to have been used by both pOtana and tyAgaraja. Of course, I looked for such phrases that would not be very common in poetry. Yet, I would hasten to admit that I cannot solidly infer that tyAgarAja did indeed borrow these phrases. · Consider the expression "nanu kanna talli nA bhAgyama" used by tyAgarAja in his kEsari rAga composition. There is a poem by pOtana which also starts as "nanu kanna tanDri, nA pAli daivama". · Consider the beginning of the rItigouLa rAga kriti "jO jO rAma" by tyAgarAja. jO jO pUrNEnduvadana, jO jO yanucun. · Consider the tyAgarAja kriti "mATi mATi ki telpa valenA" in rAga mOhana. There is a poem by pOtana that starts with the same phrase "mATi mATiki vrElu maDaci…"
It is also interesting to note that this in this poem, pOtana beautifully describes how krishNa and his male friends are having fun playing, eating etc: stealing food from each other's plates, sharing pickles, stuffing themselves with delicious items, laughing, making others laugh, etc. It is often written in tyAgarAja's biographical accounts that he was influenced by pOtana and pOtana bhAgavatam. However, details and specifics were hard to come by. In this article, I provided an informal analysis of the similarities and feel that the claims are now reasonably well substantiated. Any comments are most welcome and may be sent to chitrapu1955@gmail.com. "pOtana SrImahAbhAgavatam", originally written by pOtana-gangana-singana-nAraya and published by unnava rAmamOhana rAo, publisher "nava ratna book house, vijayavADa, 2013. Including a critical essay "Andhra bhAgavata vimarSamu" by sEshAdri ramaNa kavulu, "SrI bhAgavata mudraNamu - 1948" by niDadavOlu venkaTa rao. P. Sambamoorthy, "Great Composers - Volume 2: Thyagaraja". Kalluri Virabhadra Sastri "Thyagaraja Kirtanas: viSesha vivaraNam" (in Telugu).